Our new Thanksgiving tradition. No photos. We drive over, just in case. It’s a little Hispanic meat market on the other side of town. They have the world’s greatest pastries, and we thought it would be fun to take pumpkin empanadas to the family gathering tomorrow. But we’re skeptical that they’ll be open. Of course, they are. The place is buzzing. It feels like just another day, not a holiday at all. Maybe that’s what the new world is like. There’s no such thing as a day off anymore. We don’t live in Mayberry. We walk to the bakery in the back of the store. A little guy who must have been baking since midnight comes running over, all excited. He rattles off a long exclamation to Mo, complete with sweeping hand gestures and animated expressions. It’s all in Spanish. Mo doesn’t have a clue. But she smiles, and our excitement at his baked goods is the universal language. We start to fill our bag. We get a bunch of pumpkin and apple empanadas. Mo throws in a pig cookie. I pull out my camera to take a photo. The little guy instantly pops up. “NO,” he says sternly. He means business. I have no idea why. But then he breaks into a big smile, and says “Pie!! !” He whips a pumpin pie, topped with pecans, out of the display case. I’ve never had pumpkin pie topped with pecans. Looks like we’re starting today. The market is a carnival. Music is blaring, piñatas adorn the ceiling. Laborers are eating at small tables in the front. An old guy in front of us is buying a 12-pack of Bud Lite. Familes, grandmothers, life in motion. I realize we’re just tourists who don’t belong, but I’m happy to be a little part of such a vibrant culture. It’s hard to explain the feeling there. It just feels real. 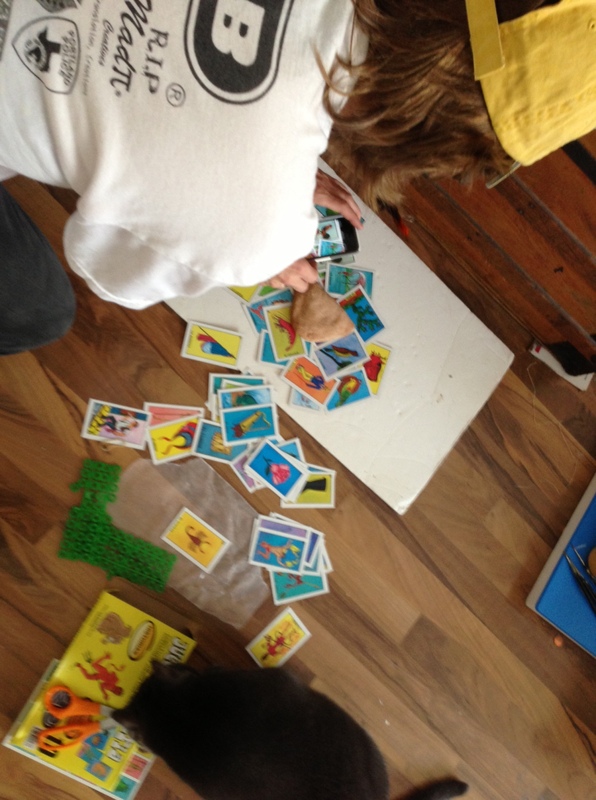 As we check out, Mo is smitten with the Loteria cards on a shelf. Our cashier speaks no English, and we speak very little Spanish. But we point our way through. I wish we weren’t the only Whitey People in this store. People don’t know what they’re missing. If only the melting pot could melt a little more. This entry was posted in margarine and tagged Corpus Christi, food, life, texas, yellow brick road. Bookmark the permalink.